Gail and Bob Boehmer recall driving through Lake City, Minnesota, many times on their way to northern Wisconsin, where they first met. Neither of them ever imagined the town on Lake Pepin would become a home away from home. The Waterloo, Iowa, couple recently spent six weeks in Lake City. It wasn’t something they’d planned. But then life happened. And after three helicopter rides and multiple surgeries at Mayo Clinic, Bob found himself in need of just the kind of healing environment Mayo Clinic Health System in Lake City offers through the Mayo Transitional Care program. The program provides patients recovering from major illness or surgery with transitional nursing care and therapy until they’re ready to go back home. Although uncertain at first, the Boehmers say Lake City’s connection with Mayo Clinic not only helped Bob heal but also eased their minds and lifted their spirits. Gail and Bob met in Northern Wisconsin 51 years ago. Gail was playing guitar at a resort restaurant when they first met. “It was truly love at first sight,” she says. They married a few years later and eventually settled in Waterloo, where they raised their three children. They have had their share of ups and downs, Gail says, but there was nothing quite like the phone call she received in 2006. One of Bob’s coworkers called Gail immediately and told her Bob had passed away. Minutes later, another call came in. A defibrillator had shocked Bob’s heart back into rhythm. Gail insisted Bob be airlifted to Mayo Clinic. She wanted the best care for him. “He’s everything to me,” she says. At Mayo Clinic, Bob had successful quadruple bypass surgery. But he wasn’t done with his heart issues. Bod had a history of poor circulation, and in early 2014, doctors discovered that Bob also had an abdominal aortic aneurysm. This happens when a lower portion of the body’s main artery (aorta) becomes weakened and enlarges. He needed open-abdominal surgery to remove the damaged section of the aorta so it could be replaced with a synthetic tube. “Bob could not undergo surgery at that time due to a heart arrhythmia that his surgeon wanted to have corrected before he could operate,” Gail explains. So Peter Noseworthy, M.D., a cardiologist at Mayo Clinic, worked with Bob for several months to get his heart ready for surgery. After more than 13 hours in the operating room in October 2014, Thomas Bower, M.D., vascular surgeon at Mayo Clinic, and his team successfully repaired Bob’s damaged aorta. The team also did a procedure to help improve his circulation. Next, the Boehmers went back to Iowa. Bob needed additional care for his abdominal wounds and chose a hospital close to home. But he acquired a severe infection. “The infection infiltrated his new surgery, and Bob began to hemorrhage,” Gail says. Once again, he was airlifted to Rochester, where another team, led by Steven Moran, M.D., a plastic and reconstructive surgeon, removed the infected tissue. While recovering from the reconstructive surgery, Bob’s health care team recommended Mayo Transitional Care in Lake City for additional wound care Bob needed before he could go home. “Best decision we ever made,” Bob says about agreeing to go to Lake City in mid-December. Gail says they were unsure at first about leaving Rochester, but Bob’s team eased their anxiety when they explained that Lake City’s hospital is part of Mayo Clinic Health System and has telemedicine technology that would allow the team in Rochester to remain an integral part of the wound care team. 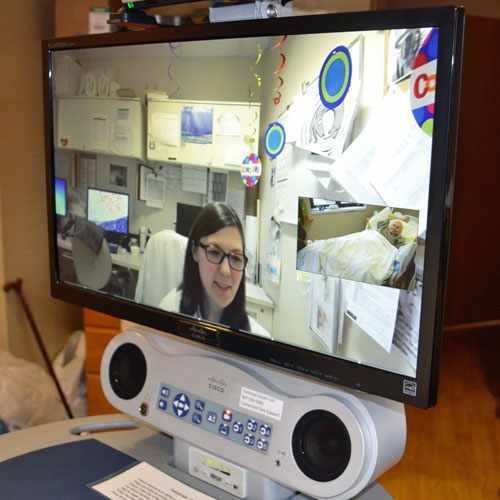 Using high-definition videoconferencing, telemedicine offers an interactive, real-time visit between patients and providers. Bob’s transitional care team in Lake City facilitated weekly telemedicine appointments with care team members in Rochester. Gail and Bob credit the staff in Lake City for not only helping Bob feel well enough to go home but also for offering a warm and healing experience. Learn more about the Mayo Transitional Care program. Learn about Cardiac Surgery at Mayo Clinic.